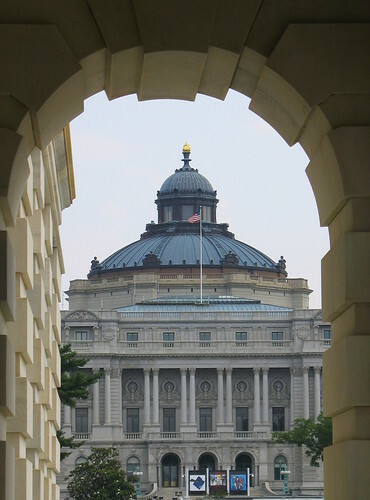 Earlier this week, the Thomas Jefferson Building of the Library of Congress turned 110 years old. I’ve been in awe of the L of C’s collection since I was a kid, but I’ve only had the chance to visit the Library twice — most recently during the ALA conference a few months ago. The numbers. Always the numbers! Jefferson sold the Library about 6,000 of his own books as seed after the Capitol was burned. The collection reached 1 million volumes shortly after the turn of the 20th century. It now holds 30 million books and adds about 10,000 more each day. Although these were impressive numbers, they were only numbers to me. As a kid, I knew the Library of Congress was a resource but it wasn’t my resource. It was of Congress, after all. As large as its holdings were, I couldn’t walk in, stroll the aisles, and pull astronomy books off the shelves to look at. I could do that in my little neighborhood library, though. My library was a resource because it was accessible. I knew Congress had a much bigger library, but I could only see its numbers. Now, twenty years into the library world, I look at things a bit differently. I appreciate the Library of Congress even more as a resource for the ages. The collection is still unsurpassed in the book world and its preservation efforts are indispensable. On the other hand, I still appreciate my other resources more. And for the same reason! 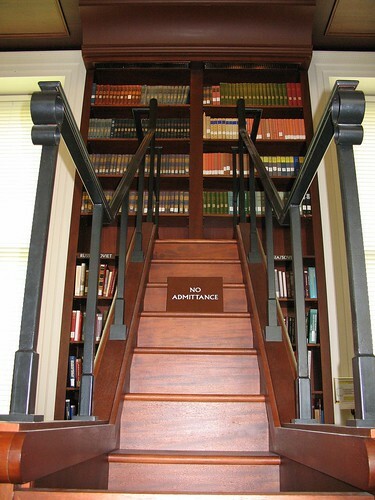 I still can’t walk into the Library of Congress and pull books off the shelves. Even with a guide leading a group of visiting librarians this summer, we were limited in our movements. The guide himself had to get permission from someone else just to enter a reading room. Meanwhile, I can still enter my local library and use it. After all these years, it’s still got the L of C beat on accessibility. I can also use countless online sources that are growing far more rapidly and much larger than the Thomas Jefferson Building’s holdings. 10,000 books per day? 10,000 libraries are included in OCLC’s WorldCat. Six million results come up in a Google search for “astronomy”. Over 60,000 blog posts are added daily on WordPress alone. A moment ago I checked Flickr and noted that users uploaded 3,533 photos in the last minute. Imagine the wealth of information tucked away in our reference databases. I’m not saying all of these numbers (or the materials they represent) are equally relevant, but they illustrate how much our intellectual and cultural resources have expanded. And thanks to digital technology, expansive metadata, and collaborative software, the information is becoming ever more accessible at the same time it’s growing in volume and depth. How many resources do you have at your fingertips for the boy asking about astronomy today? This entry was posted on Saturday, November 3rd, 2007 at 1:36 pm and is filed under library profession. You can follow any responses to this entry through the RSS 2.0 feed. You can leave a response, or trackback from your own site. You hit the nail on the head: accessibility! It doesn’t matter how big our collection is. Our resources need to be out there. They need to be used.